As part of our celebration of the Mega Man series hitting its 25th anniversary, we are featuring a look back at many of the games of the X series. For this entry, I’ll be looking at Mega Man X2, famous for featuring the Green Biker Dude and being a solid financial investment. 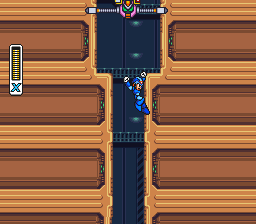 After Mega Man X's incredible and flawless rollout of new features, characters and setting, Mega Man X2 had a difficult mission: Retain the series-defining characteristics while introducing new gameplay elements that defied the atrophy that, for too many, was the defining characteristic of the Classic series. Unfortunately, while X2 does a lot right and tries some new things, all in all it falls a bit short. 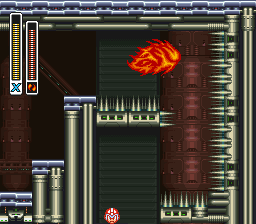 It's true that Mega Man X2 tries to innovate in a few areas, but it's just that these efforts are not quite as well designed as the number of new elements introduced in the predecessor. Sensibly, the dash boots are now a default ability for X, while the actual boots upgrade now gives the player the ability to air-dash. Which is awesome because it results in some pretty cool stuff in the latter parts of the game. Also new in the realm of armor upgrades is the dual-shot buster, which conveniently stores its second, ridiculously loopy mega shot until the player presses the fire button again. Somewhat neat is the armor upgrade's full-screen Giga Crush attack, which destroys just about anything that would be on the screen. Not so neat is the helmet upgrade's Item Tracer, which is inexplicably a selectable weapon (with infinite energy) that indicates hidden passages. This is not particularly useful outside of finding the Shoryuken (Dragon Punch) upgrade. Speaking of which, some of X2's features are interesting in that they form traditions that were carried from its predecessor and sustained later on in X3 . Beyond the aforementioned Shoryuken upgrade, X's basic charged shot is slightly different in all three games and all three feature Ride Armors that are either progressively cooler or dumb (your mileage may vary on that, for sure). 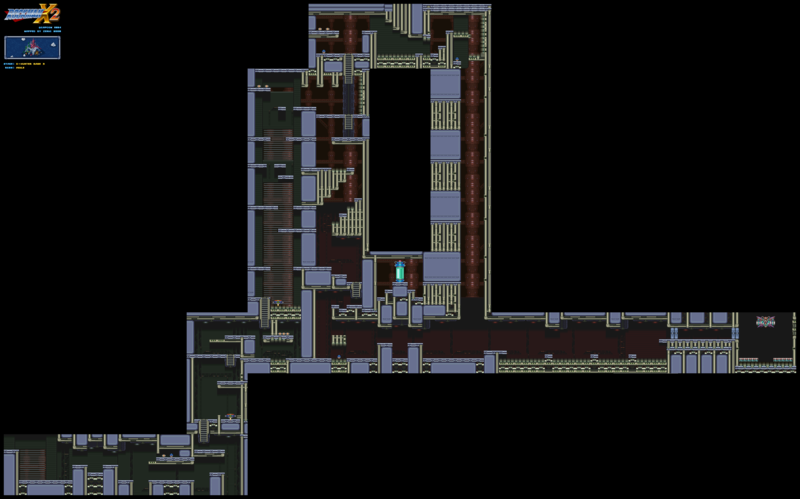 The levels in Mega Man X2 are generally well-designed in that they do not do anything wrong, but are a bit more uneven than the levels in X. Bubble Crab's sea base is maybe the most boring aquatic level in the entire series. Wheel Gator's level is in a giant dinosaur tank, which is cooler than it sounds. Overdrive Ostrich features the Cheval Ride Chaser bike, which is a definite change of pace despite it being somehow slower than Armored Armadillo's mineshaft carrier. Flame Stag's level is actually interesting, featuring a rumbling volcano and a frantic race to the top of the silo. Magna Centipede's otherwise weird trek through strange falling blocks features a targeting system that analyzes X and makes the mini-boss more difficult with each successful scan. Morph Moth's level is also a kind of cool romp through a junkyard, featuring remnants of several enemies from X. Wire Sponge's level features changing weather patterns based off of how you interact with parts of the level. Despite their merely average levels, the Mavericks in X2 are actually pretty fun to fight. Overdrive Ostrich runs everywhere, Morph Moth is essentially a two-part boss, Crystal Snail slows down time, and Wheel Gator fights from under his lair's rolling sludge. Furthermore, most bosses change their tactics halfway through the fight, beginning a trend that winds up being a great staple in the series. Like in X, hitting the bosses with their weakness tends to change the dynamics of fights-- Crystal Snail loses his shell, Wire Sponge loses his tentacles (and in the end, splits in half! ), Overdrive Ostrich freezes and malfunctions, and Magna Centipede loses his tail. The Maverick weapons in X2 are also pretty cool. The charged Speed Burner allows for a double (and triple) air dash, the Crystal Hunter turns enemies into blocks, the charged Bubble Splash forms a kind of shied that also gives X a huge boost to his jump when underwater, and the Spin Wheel travels along the ground and destroys certain blocks. Sonic Slicers bounce against walls and floors. The Silk Shot is kind of boring, but its charged form can bring in energy pellets in certain rooms. Magnet Mine is an aimable weapon that sticks to surfaces, destroying moving enemies if they come into contact. The Strike Chain can grab faraway items and can pull X to other surfaces. There's also some weird stuff in the game that tends to go under-appreciated. Beating the whole thing without any armor upgrades nets you a slightly different ending (which is possible without a hacked password like in X). You can generate passwords that can take you to any level in the game (including the fortress levels). Maverick deaths are now slower and feature blue explosions. There's hidden energy recharging rooms. This is the only X game not released on the PC. The last level is set in Magna Centipede's level for some reason. Dr. Cain's first in-game appearance is in this game, though he more closely resembles a man who got his Ph.D in Japanese literature than engineering. Oh, and there's Green Biker Dude. The music and sound feels a bit more uneven than Mega Man X. It could be that X2 just struggles to stay together thematically and so the music suffers with it, or it could be that Yuki Iwai was just overworked, but in any case the stronger anthems of the previous (and even successive) games are just not present here. I would not say that Bubble Crab needed the Sealab 2021 theme blasting, but all eight of the Maverick levels could have used a little more forte or were strangely grating. Wire Sponge sounds like it's in a morgue, Magna Centipede sounds like a decaf version of something out of Mega Man 7, and Wheel Gator's level sounds like an oversized baby is just making sounds while pushing around his toy dragon tank. The storyline with the X-Hunters is interesting and is definitely a step in the right direction in terms of building a kind of engaging and ongoing story. The optional fights are challenging and enjoyable, and the evolving story revolving around Zero is a new concept for the series. Failure to defeat all three of the X-Hunters in their secret lairs in the Maverick levels leads to a showdown with a reprogrammed Zero as the antepenultimate boss, which is arguably more fun and difficult than the X-Hunters. And as an added plus, Sigma's final speech gives clues to Zero's origins, which, hard as it may be to imagine, shocked all of us back in 1995. So, there's a lot to like. 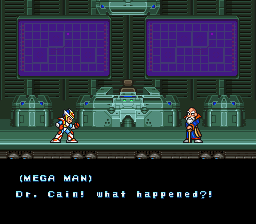 But somehow, Mega Man X2 feels like less than the sum of its parts. If designer Yoshihisa Tsuda is to be believed, between the X-Hunters and the overhyped Cx4, the development team just did not have sufficient resources to do more. This begs the question: was a wireframe Sigma really worth limitations and cut content elsewhere? How much was wasted on the chip and its mandatory meetings to discuss implementation? No fourth (and female) X-Hunter. No second form of Violen. Defeating Mavericks no longer leads to level changes elsewhere. The Ride Chaser is only featured in the first five seconds of the game, portions of Overdrive Ostrich's level, and a few pieces of promotional art. And that's just observing the more obvious shortcomings-after all, who knows what else could have been? The entire premise of the game is sort of bizarre, even for a game about a blue robot in the future. After just six months, X is (somehow) the leader of the Maverick Hunters and the entire Maverick outbreak has been tamed and the baddies are holed up in some abandoned factory. Of course, since X is the biggest novice leader this side of Captain Kirk and because we need another game, what should have been a mop-up of Six-Piece Chicken McNobodies somehow leads to another full-scale outbreak of the Maverick war. In a way, that gets to a chief problem with the entire series going forward. 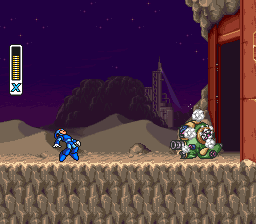 While the original Mega Man X threw us into a world where literally the foundations of civilization seemed to be crumbling and it was X and Zero against the world, X2 and to some degree all games after it fail to capture the relative weakness of the good guys versus the ever-present threat of Sigma, the Maverick Virus, and whichever toadies serve as chief lieutenants. No amount of mysterious shadowy meeting music can really make me think the X-Hunters were as bad as Sigma, Vile, and the rest of the first Maverick outbreak that destroyed an entire highway and unexpectedly killed a leader of the Maverick Hunters. Compared to the magnitude of struggle that unfolds throughout that game the fight against the X-Hunters feels more like a straight-to-video sequel. In the end, Mega Man X2 was simply too derivative, and that which was carried forward was simply not as interesting as the first time around. Levels were generally less interesting, while weapons and bosses maintained a kind of dynamism, but not in any kind of revolutionary way like in X or even X4. X2 is simply a stepping stone, a game that does not introduce enough new content on its own. Of course more than a few people love this game for what it is–a good Mega Man game. Heck, I like it as a Mega Man game. I even liked Street Fighter x Mega Man, but as strictly a Mega Man game–when people ask me for advice on what video game to go play, I am much more likely to say Portal or Ico or Mega Man X. After all, none of those games start by placing you in front of a disabled robot shooting at you. And they certainly do not quickly force you into a narrowing silo. They are designed for people who may play video games, but certainly do not already know the mechanics of that game in and out from the get-go. What is hard to swallow is that X2 really did not have an impossible task in living up to its predecessor. Consider where the X series would have been if X2 's level of innovation was the standard for the rest of the X series. Or if it was the standard for any of the games across the Mega Man series. Would we have really called Mega Man 2 a good video game if it featured less-interesting enemies, levels, and a handful of optional fights? Would there have been any more Mega Man games if Inafune and gang took that route? Evaluating Mega Man X2 gets to the crux of Mega Man fandom versus how other video gamers see our favorite series. For a lot of us, X2 hits the right notes. It maintains a formula we all love, we can pick it up and play because we know the mechanics really well. It maintains much of what made the original X so much fun to play. 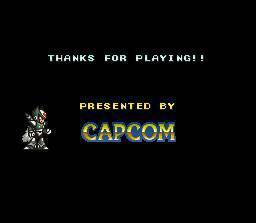 Mega Man X2 tries a few new things and unlike latter games in the series, these new elements do not ruin the game. But like some other installments of other Mega Man series this may mean we like this game a lot more than most, but there is a difference between being a good Mega Man game and being a great video game indepedent of the rest of the series. Mega Man X2 is clearly the former. Screenshot credits: Some are from GameFAQs and MMKB. James is a features contributor for The Mega Man Network. He owns a corgi and sometimes updates his Tumblr.